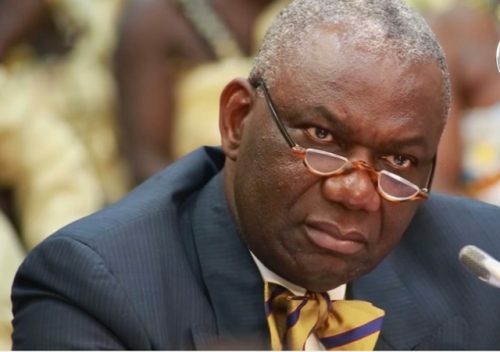 HomePoint-BlankOpinion: Is Boakye Agyarko on Trial Already? By Kwame Okoampa-Ahoofe, Jr., Ph.D.
Opinion: Is Boakye Agyarko on Trial Already? By Kwame Okoampa-Ahoofe, Jr., Ph.D. I read Dr. Rainer Akumperigya’s analysis of the so-called AMERI Deal–2 renegotiation scandal that led to the dismissal of Mr. Emmanuel Boakye Agyarko, the Energy Minister and former Akufo-Addo Presidential Campaign Manager, with more than passing interest; although, I also wondered whether any serious attempt to indict the former New York City banker would also not ricochet to include Dr. Kwabena Donkor, the Pru-East, Brong-Ahafo, National Democratic Congress’ Member of Parliament and former custom-tailored Power Minister, who initialed the first or original AMERI Deal contract with the full complicity and approval of then-President John Dramani Mahama. You see, the entire decision to renegotiate AMERI-Deal – 1, was the fact that it allegedly cost the nation at least $150 million more that the going market price. But even this is not certain, in view of fact of the great elasticity of the market. Still, what is significant to point out was the public admission by Dr. Donkor, whose doctorate is in the discipline of Business Management and/or Business Administration from a major British university, that he appended his signature to the deal without having critically examined the details, or fine print, of the contract, which is legally and technically called “Due Diligence” because he expected the Mahama government’s creditor to have done so. He would be forced to resign his custom-tailored Power Ministry by President Mahama and publicly apologize for his gross managerial incompetence and sloppiness. Talk of cultural illiteracy! In the case of Mr. Boakye Agyarko, whose first name of “Emmanuel” I have Googled and tried to confirm several times in the past without success, until I read Dr. Akumperigya’s legal analysis of the subject – of course, I am also aware of the fact that Mr. Ayarko has an NPP-MP half-brother who also has the same first name of Emmanuel, if I am not mistaken – there clearly appears to have been a dastardly attempt to literally take the Ghanaian taxpayer to the cleaners. Which makes the clearheaded reader and thinker wonder why a financial expert or guru like the former Energy Minister, at least by his own personal testimony, who once virulently accused the Mahama regime of gross managerial incompetence, would so criminally, or at least so flagrantly, and mischievously attempt to double the AMERI-Deal debt tab by having the Dubai-based AMERI company transfer its contractual obligations to a Greece-based firm called Mytilineous International Trading Company. There is a clear intent to defraud the taxpaying Ghanaian public, however one looks at the case. The one clear distinction here, though, is that while Dr. Donkor actually caused humongous financial loss to the country, a crime for which he stands criminally culpable, in the case of Mr. Boakye Agyarko, the actual crime is purely one of intent or the alleged attempt to financially crucify the Ghanaian taxpayer. No crime was ever actually committed, but, of course, there is clear evidence by those who have examined the documents first-hand that a crime was poised to being committed, except for the timely intervention of the members of a bi-partisan parliamentary committee, whose high-minded and patriotic decision not to approve of the renegotiated deal before the dubious and highly suspicious figures involved had been “critically interrogated,” in the words of Mr. Osei Kyei Mensah-Bonsu, the Parliamentary Majority Leader and the ruling New Patriotic Party’s Member of Parliament for Kumasi-Suame. The aforementioned legal analyst describes the potential act of criminality for which Mr. Boakye Agyarko stands accused as an “inchoate” or incomplete act of criminality. Dr. Akumperigya is also quite right to doubt the likelihood of Parliament opening up an investigation into the matter, with the deterrent possibility of bringing the criminal suspects or culprits to account. I perfectly agree with the legal analyst because we are saddled with a Parliament a remarkable number of whose membership stands accused of criminal salary double-dipping. In short, our present Parliament woefully lacks either the integrity or moral authority to have reckless political appointees like Messrs. Donkor and Boakye Agyarko indicted, prosecuted and possibly incarcerated or severely punished for either defrauding or attempting to defraud the Ghanaian taxpayer. In the case of Mr. Boakye Agyarko, the apparently hurried manner in which the executive approval of President Akufo-Addo was solicited and granted is another angle to the case that further complicates matters. It is quite obvious that Nana Akufo-Addo was “misled,” because he would not have so readily appended his signature to the abortive renegotiated contractual package of AMERI-Deal – 2, knowing full well that the newly renegotiated deal was going to be tabled before Parliament and vigorously debated and possibly torn apart by members of the National Democratic Congress’ Parliamentary Minority, even if only to score some cheap political or public relations points.